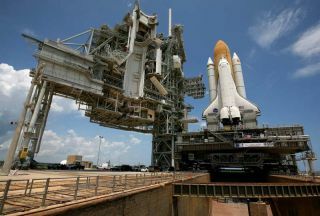 CAPECANAVERAL, Fla. - When the space shuttle Discovery rockets into orbit this week,it will carry a treasure trove of new science gear to boost research aboard theInternational Space Station. Tucked in Discovery?s payload bay is a cargo pod packed with more than 7 tonsof supplies and research equipment for astronauts aboardthe space station. Some of that gear will help support the station?ssix-person crew, but a large chunk is built to jumpstart scientific researchaboard the $100 billion orbiting laboratory. ?We reallyare starting to outfit the research capability of the station,? said NASA?sspace station program manager Michael Suffredini saidin a recent briefing. Liftofffor Discovery is set for Tuesday at 1:36 a.m. EDT (0536 GMT) from NASA?sKennedy Space Center here. The shuttleis hauling a new super-cold freezer and two large experiment racks formaterials and fluids research in weightlessness. ?They are essentiallya lab bench in space that contains a unified set of equipment for scientificdisciplines,? NASA?s space station program scientist Julie Robinson told reporters here in aSunday briefing. The newgear on Discovery is essential for the space station as it transitions from anoutpost under construction to a fully complete orbiting laboratory over thenext year or so, Robinson said. Once the station is complete, astronauts willbe able to dedicate more time to fundamental research than to its maintenanceor assembly, mission managers have said. The newfreezer bound for the station can sustain temperatures of minus 80 degreesCelsius (minus 112 degreesFahrenheit) and will double the outpost?s capacity to store biological samplestaken by astronauts. The station already has one such freezer, but its crewsized doubledto six people earlier this year, which meant more samples that needto be preserved. ?This insuresthat we have the infrastructure on orbit to freeze all the samples that areneeded and then bring them home for study on Earth,? Robinson said. The two newexperiment racks are a pair of versatilescience stations - each the size of a large refrigerator - called theFluids Integrated Rack and the Materials Science Research Rack. The fluidsrack is designed to study the physics of fluids in space in experiments thatcould help develop improved fuel tanks, heat exchangers and water systems forfuture spacecraft. Researchers at NASA?s Glenn Research Center in Ohio builtthe rack for the station. As its namesuggests, the materials science rack is built to study the properties ofceramics, metal alloys and other materials in the uniqueenvironment in order to find new ways to improve them. It has two smallfurnaces capable of cooking samples up to 1,371 degrees C (2,500 F) to revealtheir chemical and physical properties without the interference of gravity. ?The list isreally endless,? said Joe Delai, Discovery?s payloadmanager. ?Hopefully, we?ll discover new applications for existing material, oreven new materials, with this science rack.? Robinsonsaid that it should take astronauts about two months to fully activate the newscience racks once they arrive at the space station. Discoverywill also deliver fresh supplies for the 96 different experiments currentlybeing performed aboard the station, as well as a small drawer of mice who willlive in space for three months as part of a bone loss study that takesadvantage of the outpost?s microgravity environment. ?It?s anincredibly capable vehicle,? said Mark Uhran, NASA?sdeputy associate administrator for the space station, of the orbitinglaboratory. ?It?s more capable than any other vehicle we?ve every builtbefore. ?